CARACAS, Nov 14 (Reuters) - Venezuela's socialist government has arrested more than 100 "bourgeois" businessmen in a crackdown on alleged price-gouging at hundreds of shops and companies since the weekend, President Nicolas Maduro said on Thursday. "They are barbaric, these capitalist parasites!" 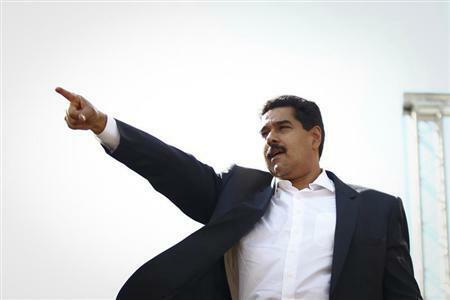 Maduro thundered in the latest of his lengthy daily speeches. "We have more than 100 of the bourgeoisie behind bars at the moment." The successor to the late Hugo Chavez also said his government was preparing a law to limit Venezuelan businesses' profits to between 15 percent and 30 percent. Officials say unscrupulous companies have been hiking prices of electronics and other goods more than 1,000 percent. Critics say failed socialist economic policies and restricted access to foreign currency are behind Venezuela's runaway inflation. "Goodyear has to lower its prices even more, 15 percent is not enough, the inspectors have go there straightaway," Maduro said in his evening address, sending officials to check local operations of the U.S.-based tire manufacturer. The move - Maduro's boldest since taking office in April - is reminiscent of the dramatic governing style of Chavez, who nationalized swaths of the OPEC member's economy during his 14-year socialist rule. The inspections have shaken Venezuela three weeks before local elections that his opponents are casting as a referendum on the 50-year-old former bus driver. Maduro has made preserving Chavez's legacy the mainstay of his government and has been matching his former mentor's anti-capitalist rhetoric. "It's time to deepen the offensive, go to the bone in this economic war," he said. Only a few of the hundreds of shops targeted with surprise inspections had been found to be offering "fair prices," officials say. Some businesses are voluntarily lowering prices - or staying closed - in case the inspectors come. "We've reduced everything by 10 to 15 percent, but it's not fair. I can't make a profit now," said the owner of one small electronics store, who asked not to be identified. "I agree they should go for the big fish, the real speculators, but they risk hurting us all." Venezuela's official inflation, 54 percent annually, is the highest in the Americas. Maduro said the forced price discounts should lead to negative inflation of 15 percent in November and 50 percent in December - forecasts that brought immediate mockery from critics on Twitter. The Venezuelan Observatory of Social Conflicts reported 39 incidents of looting or attempted looting since Friday. "We ask officials to moderate language in speeches that could be interpreted as calls to violence," the local non-governmental organization said. The campaign to reduce prices and blame entrepreneurs may play well with Maduro's power base among the poor and could help unite factions within the ruling Socialist Party. Given Venezuelans' anxiety over inflation, and scarcities of basic goods from toilet paper to milk, Maduro was risking a backlash at the December 8 nationwide municipal elections. Critics say the moves do not tackle the roots of Venezuela's economic malaise, like an overvalued bolivar that forces many importers to buy black-market dollars and then pass those costs on to consumers. Prominent pro-opposition columnist Nelson Bocaranda said Maduro's economic policies were "chillingly similar" to those of Zimbabwean President Robert Mugabe. The African leader also used security forces to enforce a price crackdown in 2007. "This shows the economic chaos Maduro has got us in where prices have no logic. The government created this monster and now tries to pretend it will control it, but Venezuelans cannot be deceived by this electoral show," Justice First said.